I've been making my own t-shirts since I've been in 7th grade or so. It's fun to be able to share them to those who might be interested :) Hope you like it. 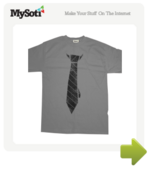 If there are any "work at home" businessmen out there, this shirt is for you!